Scotland captain Greig Laidlaw has asked fans to stick by the national side because the players are "going to Rome to win". Following defeats by England and Wales this month, Scotland have lost nine Six Nations games in a row ahead of Saturday's match with Italy. They are currently on their worst run of defeats in the competition for over 60 years. "It's hugely important for Scottish rugby that we win," said Laidlaw. 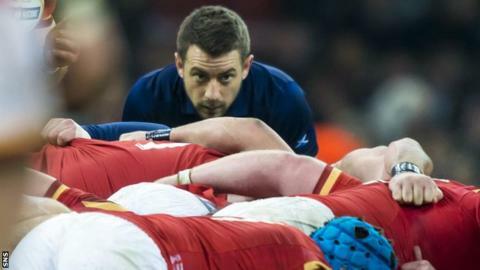 Laidlaw reiterated his view that Scotland are close to winning matches and need a little bit of luck, following the 9-15 home loss to England and the 27-23 defeat in Wales. Italy beat Scotland 22-19 at Murrayfield in last year's campaign. "We'll take any win," said Laidlaw. "Any team can play well and not win, but that's not good enough, we need to win games. "There's nobody that feels a Scotland loss more than me. I won't speak to people for a couple of days. I'm desperate to get a win, just as much as every Scotland fan is, if not more. I'll be doing everything within my powers to get us that result this weekend. "They're a sticky side, they stay in games. They had a close loss in France, which is a tough place to go and play. They were in the game with England up until the 55 to 60-minute mark. "It'll be tight but if we stay the course we can win." Laidlaw feels Vern Cotter's side can use last year's impressive World Cup campaign as inspiration. The Scots reached the quarter-finals and Laidlaw points to the crucial 36-33 pool win over Samoa as proof they can handle pressure in big games. "We played well in the Samoa game and since then our form has been pretty good to be honest with you," continued Laidlaw. "You can always learn from an experience and that game was a must-win game, and this weekend is a must-win game as well. "I've never said we've been unlucky to lose nine (Six Nations) games in a row. We've had bad luck along the way and everybody needs a bit of good luck to go their way. "We're not playing against bad teams. To go to Wales is an extremely tough place. We're not getting clobbered by a lot of points, we're right in these games. "We're sick of saying it, I'm sick of saying it. We simply need to find that little bit extra. We just want to get that win under our belt. "The support has been incredible, we value it highly as players. Stick by us, I know they will because that's the Scottish mentality. We're going over there to win that game as much for them as for us."